If I asked you what marketers love, what do you think they would say? Some would say they like to strategize new marketing campaigns. Others would say they like carrying out outreach campaigns. Buy most would say one thing: Facebook ads. 93% of marketers use Facebook advertising regularly. 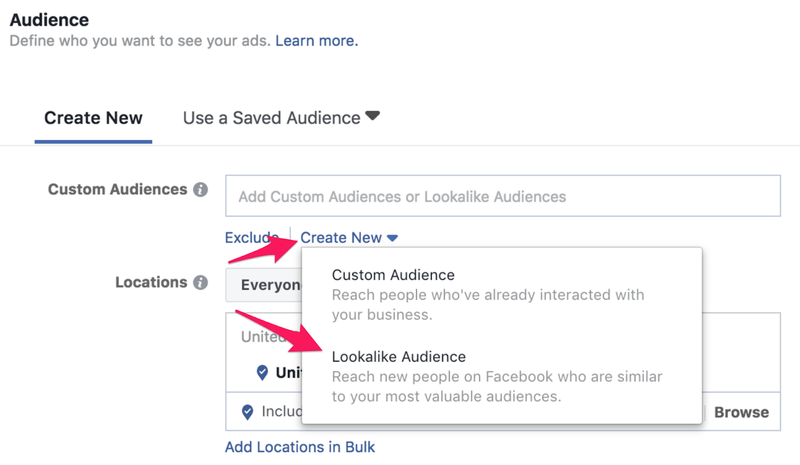 With 6 million businesses using Facebook ads, marketers love them for a single reason: they work. 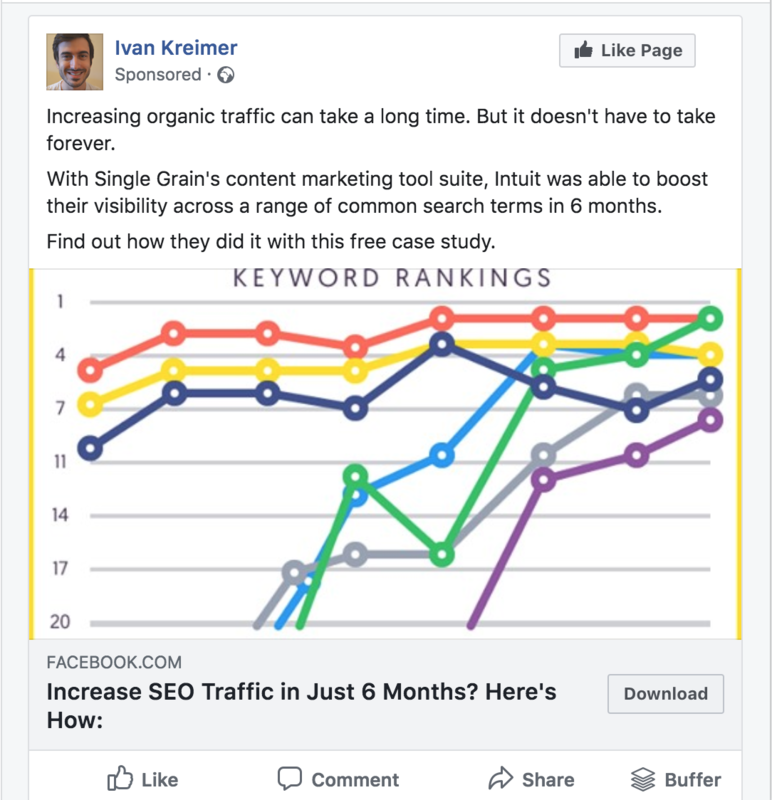 A successful Facebook ads campaign is more than the advertisements that make it: behind every high-performance campaign, there’s a solid funnel. 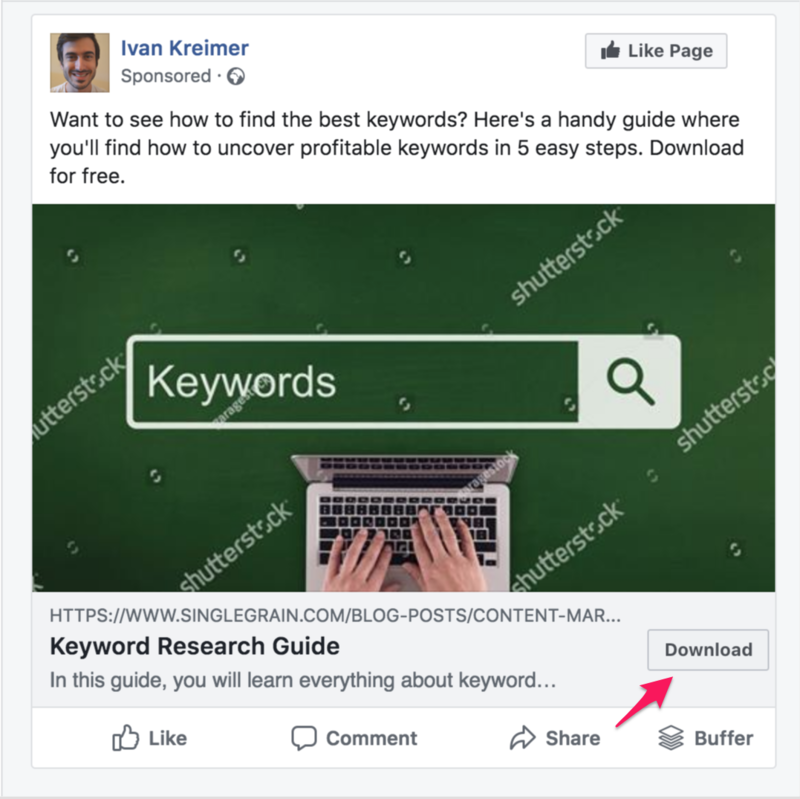 In this article, you will learn what a Facebook ads funnel is, how it works, and how to create one for your company. A funnel is the structured set of steps a potential customer needs to go through before they can reach the final conversion. The goal of your funnel is to take someone from being a person who doesn’t know your brand or product to taking action (sign up, download, purchase, etc.). In this case, it’s to sign up for a trial membership of your tool. 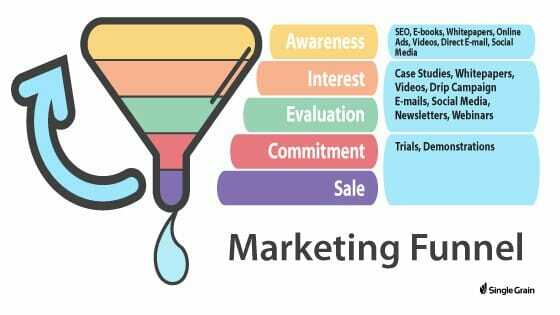 As you can see from the image above, a marketing funnel can be implemented through different channels — like SEO, content marketing, and email. 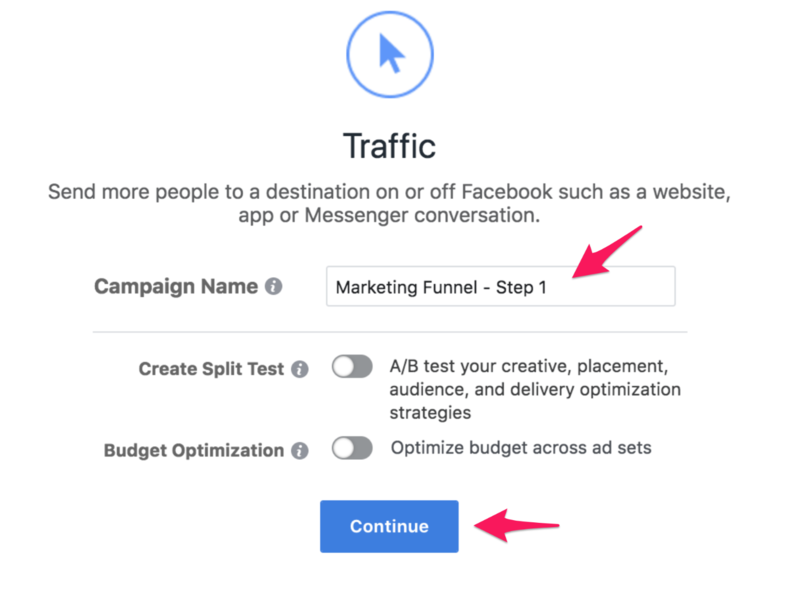 A Facebook ads funnel works the same as any funnel, but every step (or touchpoint, as it’s often called) will be done through your Facebook ads. Awareness: The buyer doesn’t want or need a product right now because he doesn’t have a problem (or he doesn’t know it yet). Interest: The buyer knows he has a problem and is learning more about it. Evaluation: The buyer is actively looking for a solution and is considering different options. Decision: The buyer has decided on a solution, and just needs a bit more information about it. Goal: Retarget your warm audience to sign up for your email list with the help of a freebie, like a drip email campaign, e-book, checklist, etc. Of course, depending on your type of offer, size, and business model, your funnel could look different than this one. For example, an e-commerce store will have a much easier time trying to get the $50 sale than a Fortune 500 company that is trying to get a VP interested in a software demo. While the former has a specific offer that can be taken online, the latter can’t close the deal through Facebook, but can create the interest to eventually do so. In such a case, each step in the funnel can be split up into smaller pieces, so it’s easier to move the stakeholders down a long-term, complex funnel. Since there are so many different ways that your funnel can look like, the one we’ll show you in here is a simplified version for a SaaS company that wants to promote their software. Adapt it to your own needs as you seem fit. Before we get started with each of the four funnel steps, you need to have a couple of things in place. Install Your Facebook Pixel. The Facebook pixel will track any Facebook user who visits your website. Once you track them, you can use the information you get from their visit to improve your targeting. If you haven’t installed a Facebook pixel, this official guide will show you how to do it. 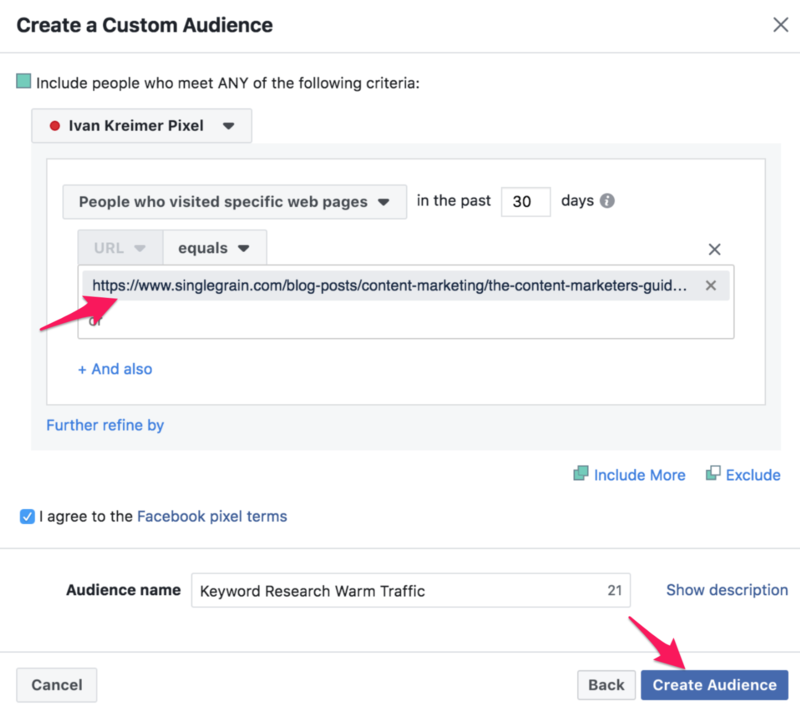 You can also follow the steps in our Facebook retargeting guide to do so. Have a Facebook Page. Having a Facebook page for your business will help you build the audience to whom you will promote your content. It can also work as a social proof mechanism. 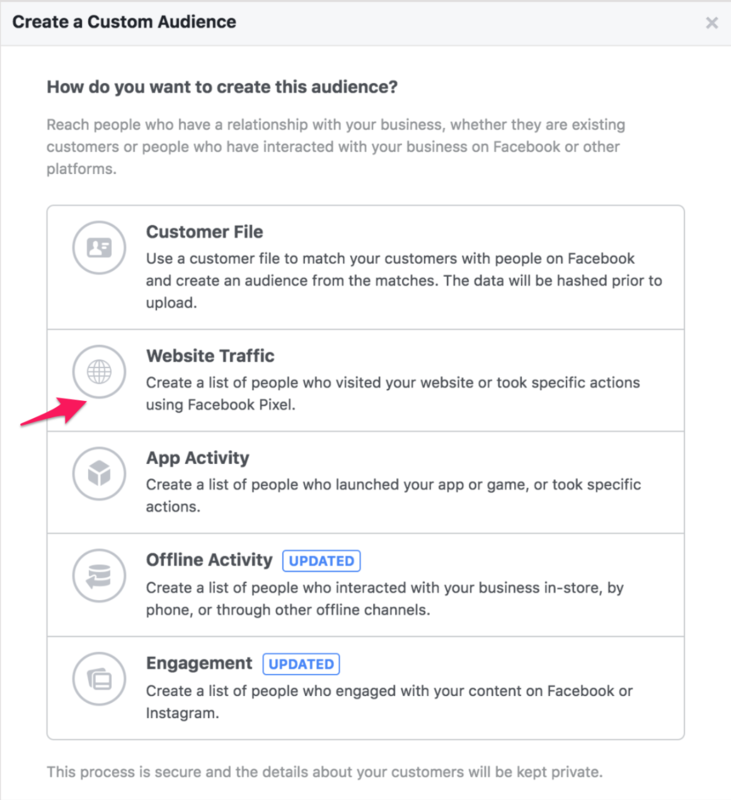 If you haven’t created a Facebook page yet, check out Facebook’s guide and start right now. Know Your Offer. Your funnel needs to lead people to an offer. As you saw, you can use a funnel in any kind of business: e-commerce, SaaS, informational products, and more. In our case, our goal is to promote your SaaS trial sign-up. In your case, you need to think about where is your content leading to. Is it a consultation? Is it a software trial? Is it a physical product? Whatever it is, you need to know that, so you can reverse engineer the different steps that lead to the offer. Let’s now get started with the first step of the funnel: awareness. We’ll start our Facebook ads campaign with a traffic generation campaign. Our goal in this step of the funnel is to “warm” our audience so that we can target them through a custom audience. You will be showing an ad to get people to click over to your site. In this campaign, you are going to promote your most popular content. Why your most popular content? Because if people already like your content, chances are they will also like it when they see it on Facebook. Of course, your ad creative and target matters a lot, and we’ll cover that, but why guess which content to promote when you already have proof that people like it? 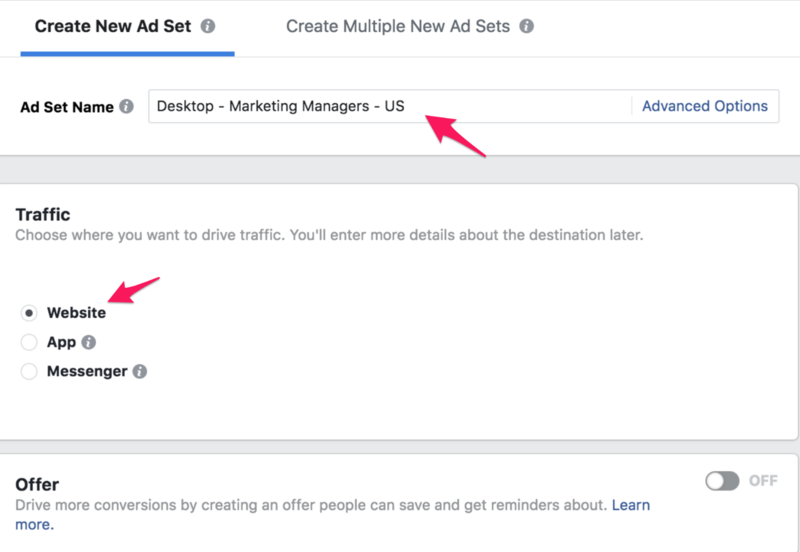 To get started, you’ll have to go to your Facebook Ads Manager. 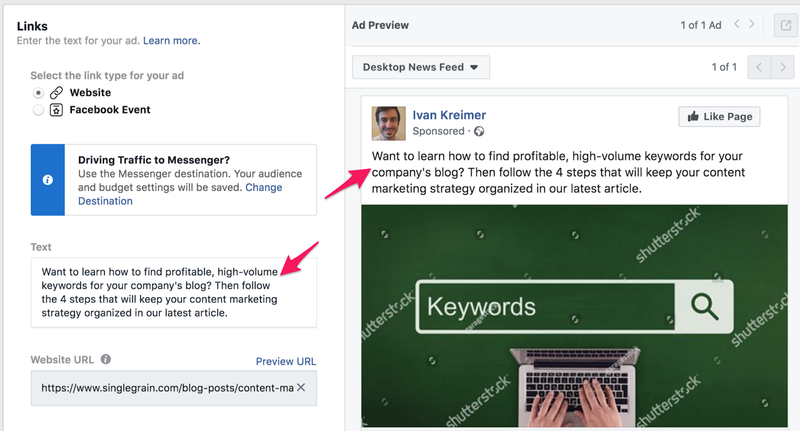 You can also use the Facebook Editor if you are more comfortable with it, but since we want to create a simple campaign, we’ll use the former. In the marketing objective menu, you’ll have to select the “Traffic” goal. Then you need to create the different ad groups. For simplicity’s sake, we’ll create two main groups: one for desktop and one for mobile. 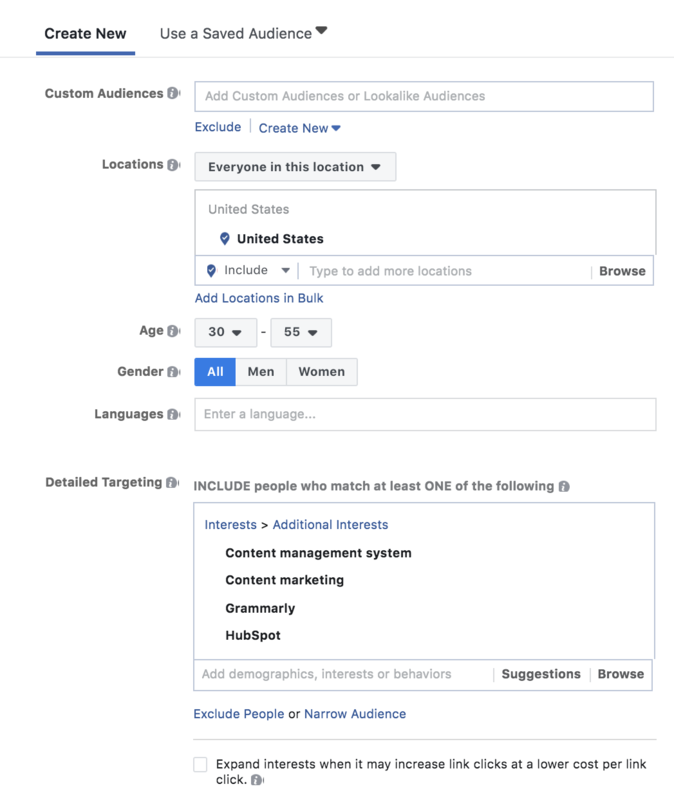 You can also segment your ad groups for more specific attributes to your campaign, like the audience, budget, and more. Once again, give it a name (and use the same structure). In this case, we’ll go with the main segment (desktop), the target audience (marketing managers), and the country. Now we are going to work on one of the most important aspects of any Facebook campaign: targeting the right audience. For the former, you will use core targeting to find your audience. While it won’t be as close as the actual people you want to get to open a trial account, it’ll still be quite close. You can later refine it as you learn more about your audience. 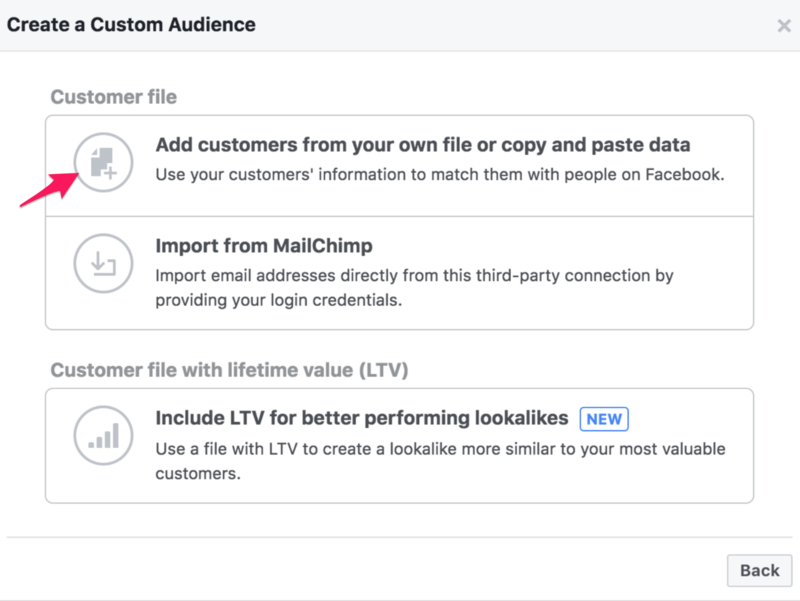 For the latter, Facebook models your ideal audience from actual leads and customers, making lookalike audiences a great way to attract new people to your site. Of course, this audience could be much more detailed if we wanted to. If we knew where most of our clients were located, we could use only specific cities or states. We could also exclude part of the audience if we wanted to ignore people who, for example, like social media. 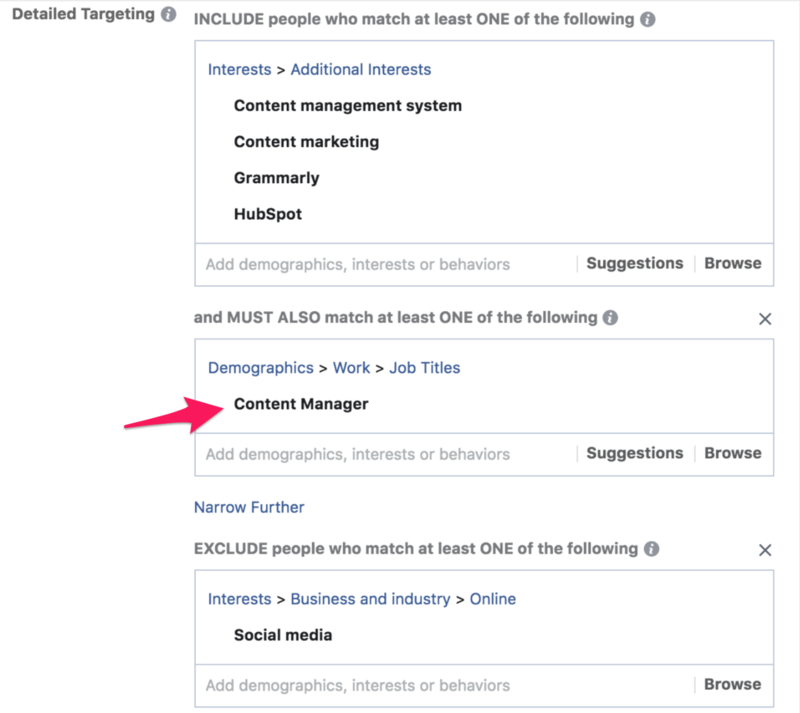 We could also narrow the audience and add a targeting parameter that every user targeted in this campaign must match, like people who work as content managers. The next option is using lookalike audiences. 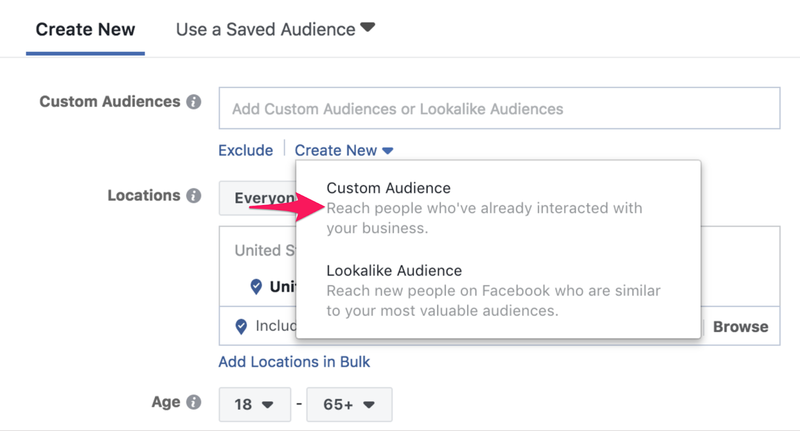 To create one, Facebook recommends having an audience of between 1,000 to 50,000 people. You can create a lookalike audience with fewer people, but do it at your own risk as that may lower its quality. 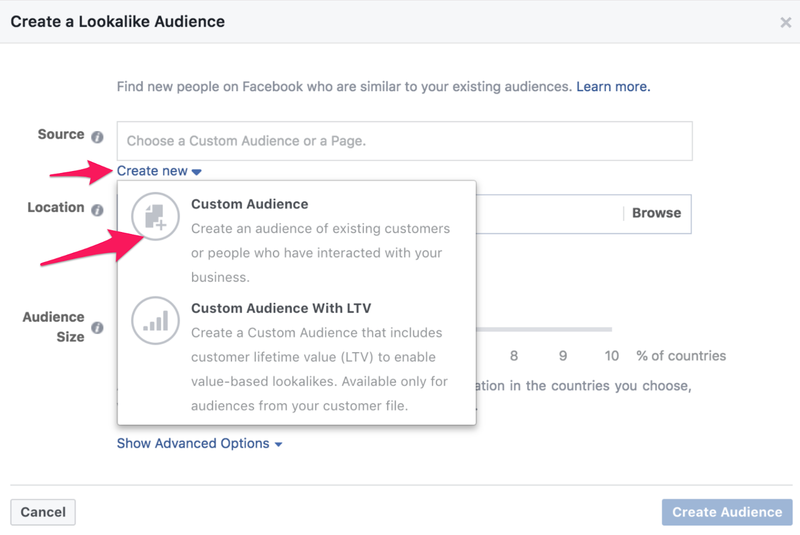 You’ll need to add a source, which could be your Facebook page, a custom audience, or the newer custom audience with LTV. I won’t get into the details of the latter, but if you want to know how to use it, here’s a handy guide that will help you get started. Now you will face a long list of options, but you want to focus on the first one because you will use only the data from past customers or current leads you have. Click on the first option to add the list. Start by selecting the “Identifiers,” which are the columns of your customer or leads sheet. For example, if your sheet includes email, first and last name, ZIP code, and phone number, then select those identifiers. Then, add the sheet — unless you want to copy and paste every cell manually, which I don’t recommend for lists that have more than a couple dozen people — and give it a name. Later, you will be taken to three different menus where you will double-check the data you uploaded to Facebook so it can do its job efficiently. After you have added the custom audience, you have to define the location of this lookalike audience and its size. 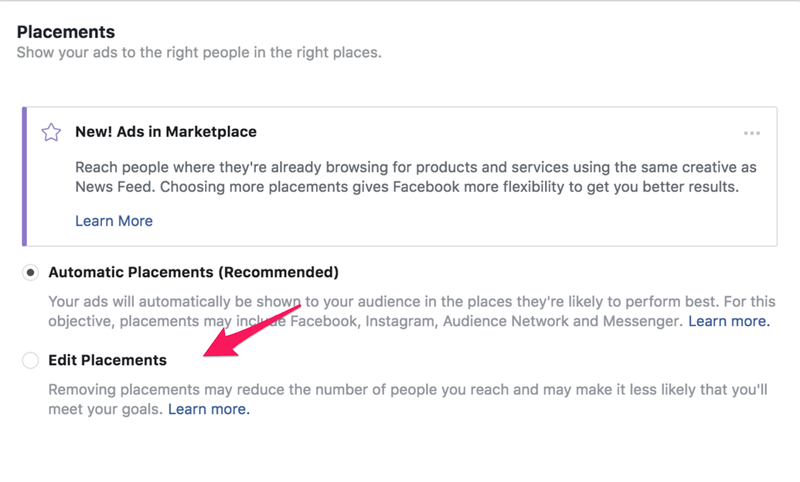 For the location, try to select your country, because the larger the population, the more data Facebook will include in the lookalike audience. As a SaaS business, you can sell your software anywhere, so it doesn’t make much sense to add a state or city. 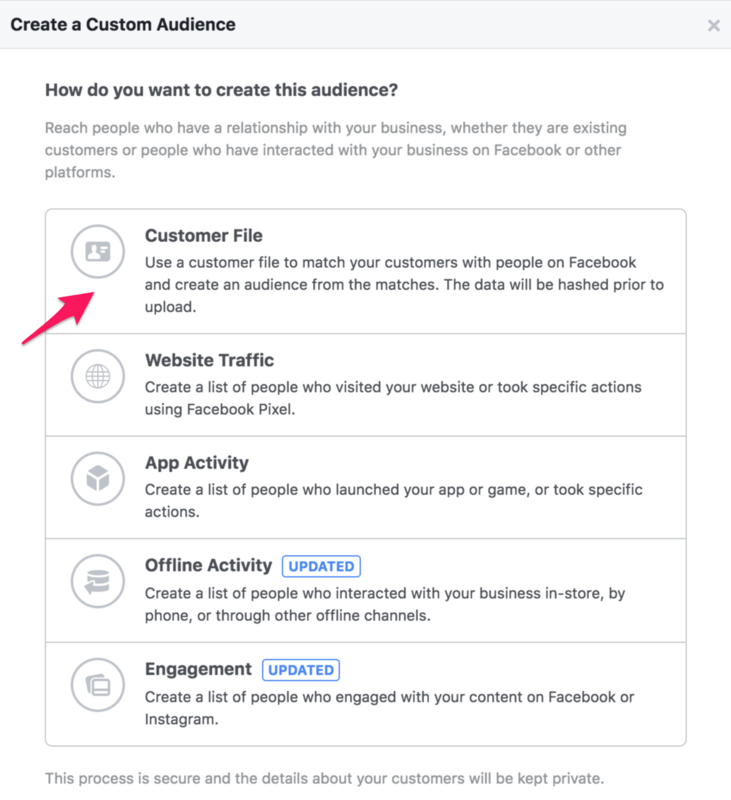 Then, when selecting the audience size, select the smallest audience possible, as they often perform better because Facebook matches your source more precisely. Once again, increase the size at your own peril. Click on “Device Types,” and select “Desktop Only” (you will repeat this same process later on for the mobile audience). Since we want to promote a piece of content, we’ll focus on the feed and leave out the right column placement. 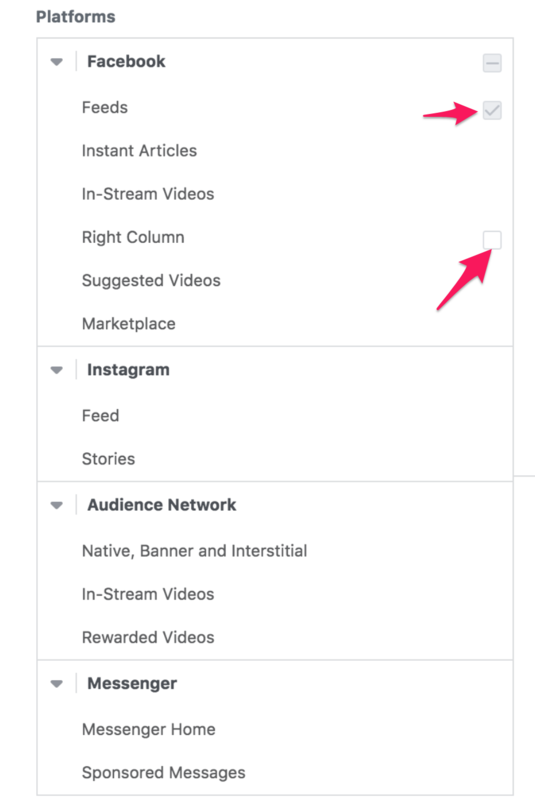 In “Platforms,” deselect the “Right Column” option, leaving the “Feeds” option as the only one to target your ads. Scroll down to “Budget & Schedule” and determine the budget. In this case, there’s no right or wrong answer on how much you should spend, as this depends on your budget and desired goals. Generally speaking, the more you invest, the more traffic you will drive. If you want fast results, allocate more cash to your daily budget. Since this is the first campaign you are creating, don’t go overboard with your budget because you will have to create three more campaigns later on. You need to divide your total monthly budget by the four campaigns. Another important aspect to consider when defining your budget is that the further away your campaigns are from your conversions, the harder it will be to determine your return. Therefore, it’s common that paid advertisers spend more in campaigns focused on the later stages of the funnel, and less in the ones that are in the top of it, like in this case. Let’s say we have a daily budget of $100 — or $3,000 for a month’s work. If we distribute our spending equally among our four campaigns, we’ll spend $25 per day on each campaign. Since we are planning to have two ad groups — one for desktop and one for mobile — we’ll set our daily budget to $12.50. Under “Schedule,” we’ll leave the ad group as it is, running continuously until we decide to stop it. If you want to test your campaigns before you invest more money, you can pre-determine a set end time. Click on “Continue.” Now it’s time to create your ad! To help you do this, we’ll have to get more specific with our example campaign. 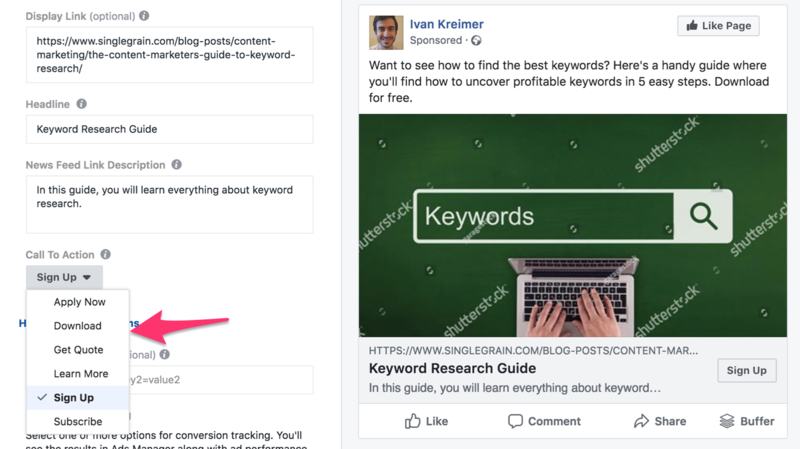 Since I said that you will use a popular piece of content for this campaign, we’ll use our article called The Content Marketer’s Guide to Keyword Research, which has gotten over 530 social shares and almost 200 backlinks. Note: If you are going to test URLs, headlines, display links, and other elements, you may want to add them to your name as well. “Copy 1” is only a convention I set up which is specific for this campaign. I could give a more specific name if I wanted to. For example, if the “Copy 1” was focused on generating interest with a question, I could have named this ad “Interest” or “Question Interest.” Select the actual naming convention that’s the easiest for you and your team to analyze. You should still keep a specific structure for future campaign creation. After naming your ad, you have to select your business’ Facebook Page. Now it’s time to select an image. In this case, we’ll use a free stock image that Facebook provide us. Scroll down a bit, and add your post’s URL. 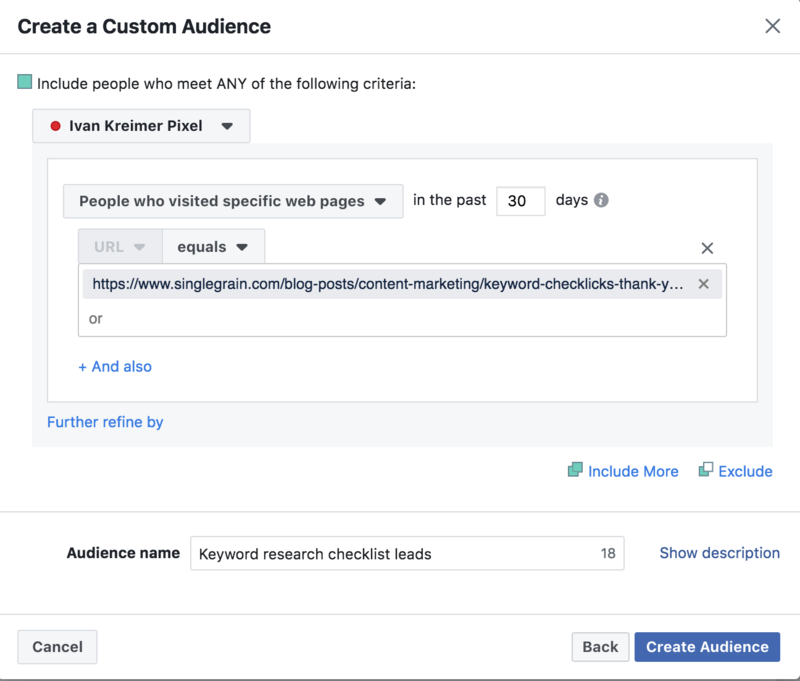 When it comes to Facebook ad’s copy, you can write short or long copy, which will depend on your offer, the step in the funnel in which you are creating your ad, your experience, and preference. Generally, longer copy works for offers that demand a lot of effort from the user (like signing up for a gated piece of content) when she isn’t ready for it yet. Since you have a funnel, you’ll be warming people slowly to your offers, which means you may want to use shorter copy for now. But, as always, test and see what works best for you. In the ad’s headline and news feed link description, you can keep it simple and use your article’s name. You can get more creative if you want, but in this case, we’ll use the article’s name as it’s already quite good. Respecting the news link description, you can keep it empty if you want to have a simple ad, or you can add some copy to spice things up. In our case, we’ll add a description of the article. Repeat the process for all the ads you plan to use for each ad group. The same applies to the mobile ad group we mentioned earlier, and to any other ad group you plan to use. After you have created your traffic generation campaign, it’s time to start getting some leads to your site. For this campaign, we’ll use the Facebook lead ads so many marketers are raving about. 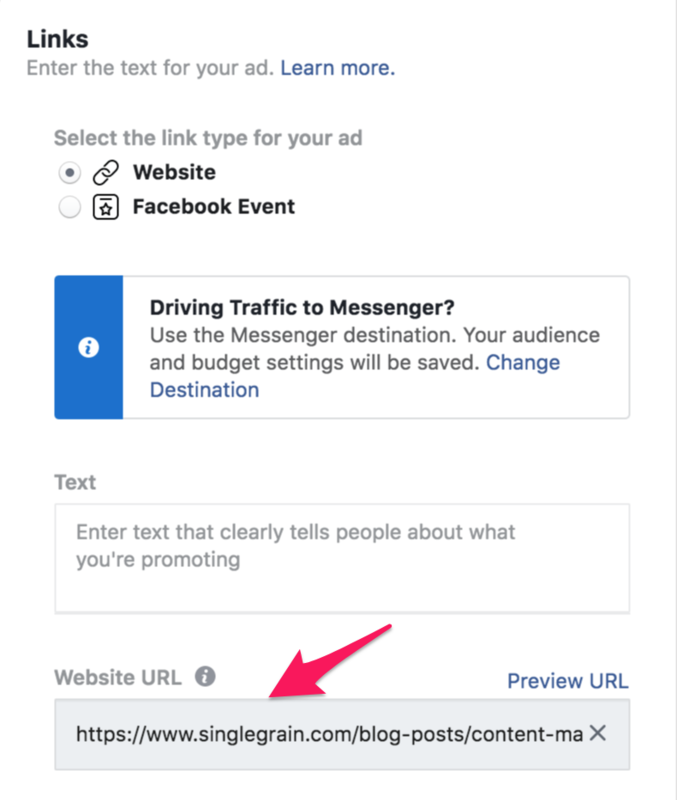 While in the past you had to send people to a separate landing page where they had to add their personal contact, the Facebook lead ads work perfectly with the user’s behavior, particularly on mobile devices. Creating this lead generation campaign is almost the same as the traffic generation one you saw before. The main difference with the other campaign is that in this one you will use a custom audience from people who visited the page to which you drove traffic. To create this custom audience, you will have to follow the same steps you saw before to create the one for the lookalike audience. The only difference is that you will target the traffic to your content page only. To get started, go back to the campaign creation page, and select the “Lead generation” objective. 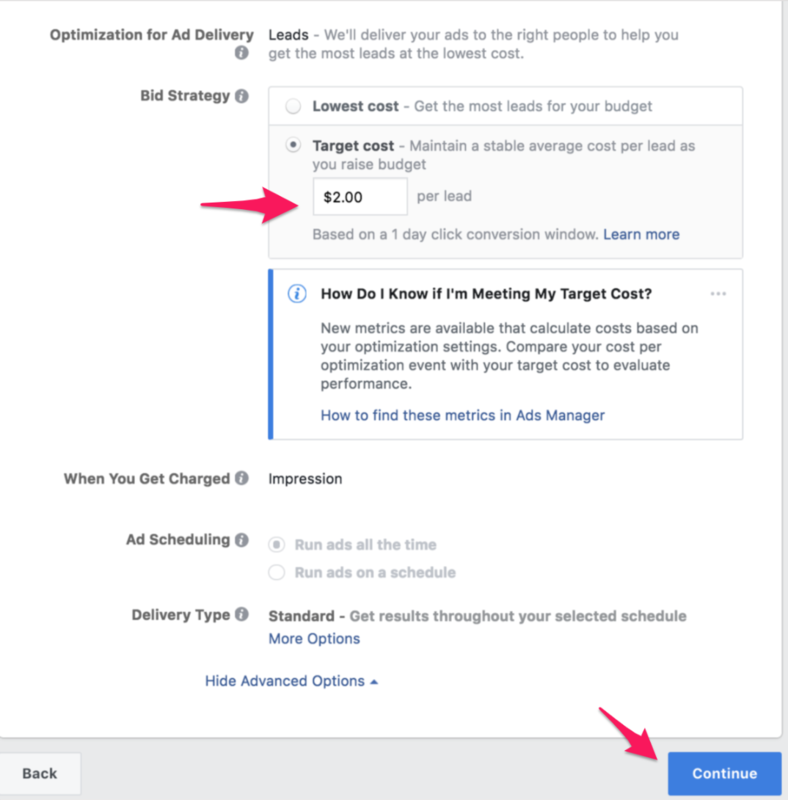 Define this ad set budget and scroll to “Bid Strategy.” Here, you need to set up whether you want the lowest cost for your leads or if you want to set a target cost for each one. There are many ramifications around this decision, but to keep your campaign management as simple as possible, select the latter option and define a cost that makes the most sense. Since in our case we want people to download a checklist or report, it’s a good idea to choose the “Download” CTA. Finally, you need to develop the leads form. 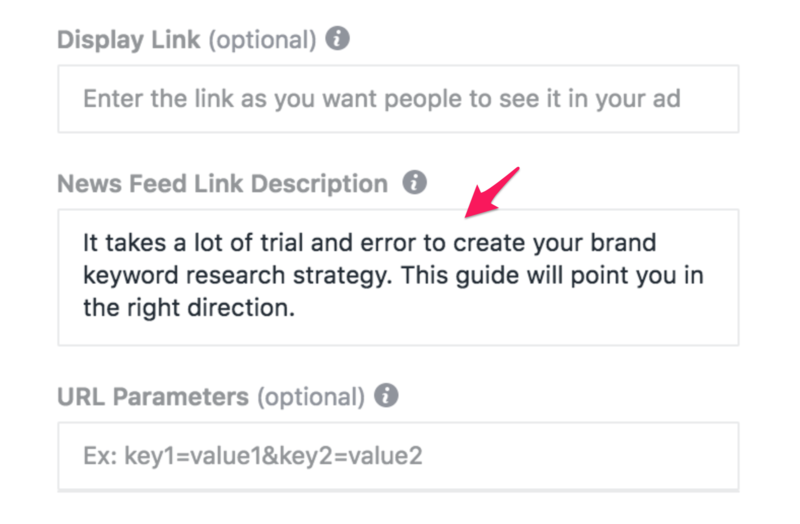 To do so, I highly recommend you check out the article we wrote on Facebook lead gen ads so you can see how this is done. Now that you have attracted a group of leads, it’s time to take them even further down the funnel. What the evaluation campaign will do is repeat the process laid down before. The only thing that will change is the offer: instead of showcasing a checklist or an e-book, we’ll be focusing on something like a case study, a webinar, or a product sheet, among other high-value content offers. Say that we wanted to promote our Intuit case study. While this one isn’t gated, for the sake of this example, let’s pretend that it is. We’d go to the ads manager creation page, and select the lead generation objective once again. Repeat everything you saw in the previous campaign, except the audience. In this case, we want to create another custom audience for those people who visited the thank you page of your previous offer. After you have selected the “People who visited specific web pages” option, add your thank you page in the URL box. Edit the placements and define the target cost, and move to the ad creation. At this point, your audience should be familiar with your company and interested in learning more about your solutions. That’s why your copy should focus more on the results you can deliver than anything else. Notice how I added an image to illustrate the results, which in this case is an increase in Intuit’s keyword rankings. You’ve gone far in your quest to drive more trials for your SaaS business. Now it’s time to finish the process with the final conversion: the sign-up. In this last campaign, you will be focusing on the conversion objective. In this case, we want people to sign up for your trial. If you sell a more complex solution that needs a consultation first, this may change. But assuming that your offer is a free trial, you should choose the “Complete Registration” conversion. In order to track that registration, however, you need to install the conversion tracking. To do so, I highly recommend you follow this guide, which will show you how to do it. Below the audience, you want to create a custom audience from the people who have signed up for the previous offer you had, which could have been a webinar, a case study, or anything similar to that. Remember to edit the placement for desktop, and to repeat the same for the mobile ad set, showing your offer in the feed. 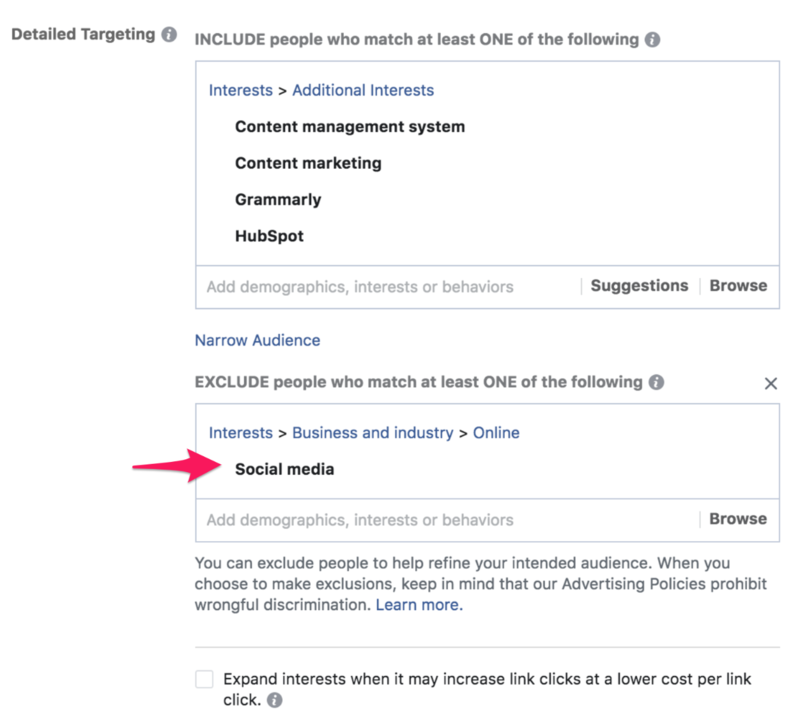 If you want to show it in the right column, which in this case makes sense, you need to create a separate ad set so as to improve the targeting, bidding, and ad optimization. Use a budget as previously defined. Your conversions may cost a bit more, as you are asking for something that takes more effort and commitment from the users. However, since you have made your custom audience commit to previous smaller actions, the conversions may be higher than usual. Finally, for the ads, follow the advice shown previously. 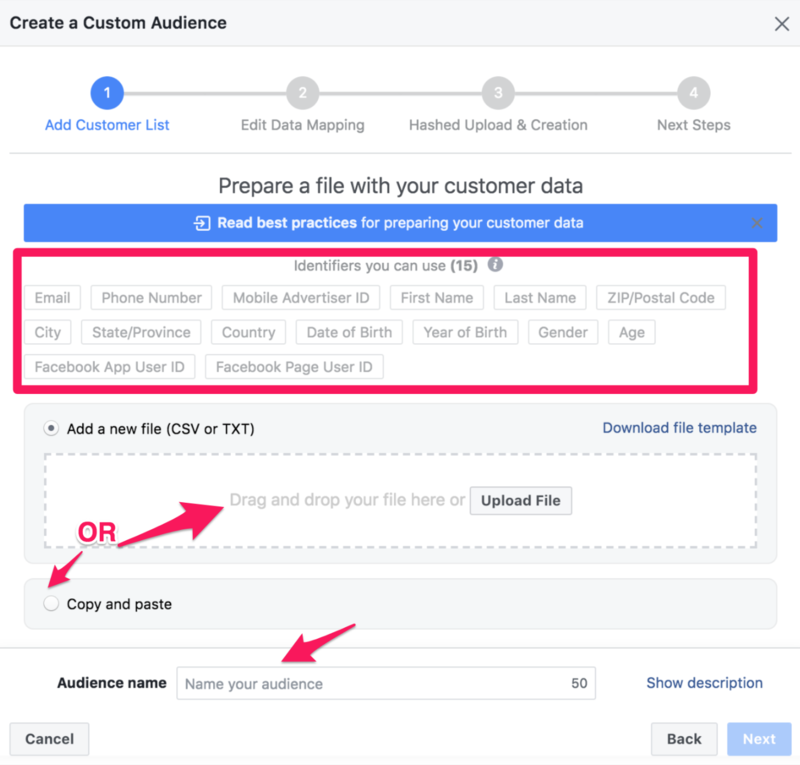 Creating a Facebook ads funnel for your SaaS business is no easy matter. It will take a lot of work to map out every step in the funnel that gets people to sign up for your trial offer. With this guide, you’ve seen how to break down the funnel in the simplest way possible. Remember, your funnel may look different than this one. You can split each step even further if your offer is more complex and takes more touching points. What matters is that you keep your leads flow through your funnel, following up with your offers.